Scarlets coach Wayne Pivac says Wales will have a "great" full-back for the autumn Tests, whoever is selected. Leigh Halfpenny made his Toulon debut on Sunday while Liam Williams has impressed for Scarlets this season. The pair could face each other in the European Rugby Championship on Sunday. "I've seen a lot of Liam and if anybody is playing any better than him then Warren Gatland is going to be very happy because he's going to have a great full-back," said Pivac. "Hopefully that will be one of the joys that we see at the weekend, and it will be exciting." Scarlets meet Halfpenny's Toulon, the Heineken Cup champions, at the Stade Mayol on Sunday, with coach Pivac aware that performances in Europe could affect international selection. Williams has started Wales' last three international matches after Halfpenny had surgery on a shoulder he injured in the 29-18 Six Nations defeat by England in March. The 52-times capped Halfpenny, 25, joined Toulon from Cardiff Blues in the summer. But a groin injury delayed the 2013 British and Irish Lion's Toulon bow until their 21-10 defeat by Toulouse on 12 October. 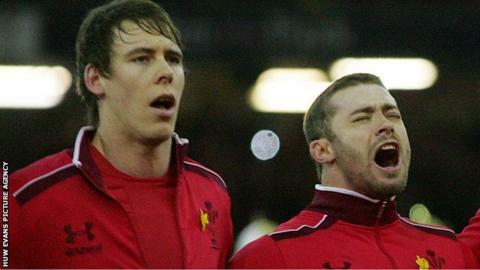 While Halfpenny has been sidelined Williams, 23, has impressed for the Scarlets with his attacking flair and bravery. However, he was sent off after picking up two yellow cards in the 32-32 draw with Ulster on the opening weekend of the Pro12. And Williams was also involved in controversy during the second Test in South Africa in June when he conceded a penalty try in the final minute of Wales' 31-30 defeat. "[Sunday will] be a great game to play in, especially for our internationals," Pivac said. "There are some big names in the Toulon side and I'm sure as far as Warren Gatland is concerned he's going to make some selections around the way people perform in these matches. "So there's a lot to play for." Scarlets will travel to France without two Wales internationals. Scrum-half Gareth Davies has been ruled out for up to 12 weeks with a knee injury, and captain Ken Owens is recovering from neck surgery.